Re: Choosing ranks that may enter your games????? This already exists. Go to callouts, find the thread with the level of players you wish to compete against, and find out what their standard password is. Make up some private games and post em in the thread. In short, it was rejected in 2006 and has been again every time it has come up since and I'm sure it will be this time too. Yeah this idea is open to Risk Snobbery. Any rank should be able to play any rank.The better player will prevail. I don't think there should be a limit as to who can enter the game. However, there could be a dropdown in game finder that allows one to search for games with the rank one is looking for. e.g. I want to play a 1v1 game against a captain. I can use the dropdown to narrow my search against all players waiting in a 1v1 game. Just a way to narrow searches further since there are so many games awaiting players. Note: Anything below sgt. shouldn't be included so people can't go looking for noobs and bad players. I like playing new people, but i dislike playing new people that deadbeat or are clueless. 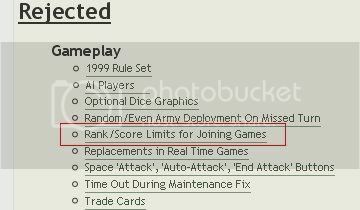 In the section where you start a new game ... Would it be possible to add a rank limitation as one of the game options? So that those who would like t test their skill against more even ranked players can choose to do so. This has been rejected MANY, MANY times. Please do a forum search before making the suggestion. You can check out the Callouts forum for private ranked games and leagues. LOL KINDA FUNNY HE OUTRANKS YA ALL...LOL WONDER WHY YALL DONT WANT A BLOCKING SYSTEM LOL NOOBS!!! THORNHEART wrote: LOL KINDA FUNNY HE OUTRANKS YA ALL...LOL WONDER WHY YALL DONT WANT A BLOCKING SYSTEM LOL NOOBS!!! Last edited by owenshooter on Thu May 28, 2009 7:54 pm, edited 1 time in total. You could play Private games with the ranks you're looking for, you could jump into the last spot of a game awaiting players (so you can see the rank of everyone who will be playing) or you could apply to join the Officer's Mess (find it on the Usergroup List, I can never get the usergroup individual pages to link ). sailorseal was later cleared of all busts and blocks. Choosing ranks that may enter your games????? Limiting Experience level of players in a new game. One of them has already been marked *previously rejected*, you guys really need to do a post search before making a suggestion. Otherwise you end up with epic duplication like this. InsomniaRed wrote: Pretty sure this has been and will be rejected. Deathwind wrote: Ok i like to play 1v1 but i was a captain and this moron joins my game and wins after I had the game basically cause of a cash of 3 cards I think.He was like a cadet and took so many points(46 to be exact) from me.I think there should be a thing so you can block like guys of a certain rank or lower from joining your game....please do it!!!!!!!!!!!!!!!!!!!!!!!!!!!!!! Please explain why he was a moron? He had a lower rank than you, but beat you in a 1vs1 game where no one else can interfere or mess things up for you. The scoreboard has a self-leveling feature for determining score. If you are a captain, and lose to a lot of people below you, then your captain rank was too high and you will obviously drop in score. If this drops your score too much, then you will start losing less and winning more which will bring your score back up. In the short run, this can cause a lot of fluctuation in score, but in the long run it starts to level you out on a "true" score for a given setting. If you can't maintain a certain score, that is no fault of the game engine or the score system or anything else. It just means your score was too high for the settings you wanted to play. If you're really as good as your rank suggests, then you should have nothing to fear from lower-ranked players. Don't be afraid! Surely he's not still...almost...a mod, is he? Mind if I make that my sig, there seems to be some question lately? Woodruff wrote: Surely he's not still...almost...a mod, is he? I think he's as close as he will ever be. Concise description: I would like to have an option to play 1800+ games without setting my game private one. Inviting cooks, cadets, new recruits etc are considered to be farming, right ? I dont like to play against cooks, cadets, and new recruits who dont have idea what to do, how to play etc. It doesnt give any taste. Private games, dont fill quick and i am forced to play always same ppl to whom i PM and invite. Callouts doesnt work or works partially cos of huge portion dont read them. Cooks - cadets (mainly low ranks) with the current pointing system, plays careless, plays brave cos they have nothing to lose.... I am bothered and abused by them all. With the BS dice of this site, sometimes the skills all i put in a game come not enough and i lose 70 points against a cook. What the H is that ? I am a customer, i am given to make private game option. For what ? To play against whomever i want, to set my games to be what ever rank minimum games i like..Right ? Then why dont you make it easier and practical ? I want public minimum rank defineable games. Only players who meets the conditions will be able to join in. It is not the problem that how great combination of my words are Mr. Sharp Brain. What kinda addition you put in this thread with your observation statement ? This has been rejected many times over.....it's not a new suggestion. Night Strike wrote: This has been rejected many times over.....it's not a new suggestion. Would you tell me some reasonable explanation please ? And also, why then there is officer call outs ? 2000+ call outs ?